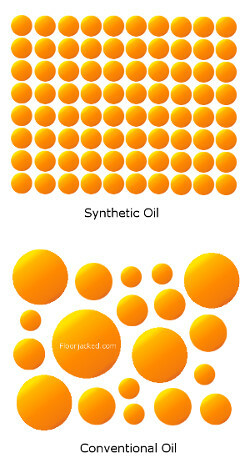 Click here to see examples of synthetic oils. Perhaps no single thing is more relevant to the longevity of your car’s motor than choosing the right oil. Whether you drive a 1975 Ford Pinto or a 2016 Porsche GT3 RS, engine oil is the lifeblood of your car and without it your engine would fall apart in mere seconds of runtime. Engine oil prevents this and protects your engine by reducing friction related wear to its components. It does so by coating the surfaces of all moving parts in your engine to allow them to glide past each other more easily. When it comes to selecting a specific oil for your car, thankfully the manufacturer typically gives you some basic guidance to point you in the right direction. In your owner’s manual, you will typically find a recommendation for the correct oil weight and sometimes oil type for your car. If you no longer have the owner’s manual for your car, often times the recommended oil will be marked on your oil cap as well. Sometimes your manufacturer may suggest that you use synthetic oil specifically, but often times the manufacturer doesn’t make the distinction. That said, in most cases we recommend using synthetic oil unless the manufacturer of your automobile specifically recommends against it. When discussing the advantages of synthetic oil, these advantages are usually conveyed using a comparison between synthetic and conventional oils (also known as mineral oils or the slang term “dino oil”). Relative to conventional oils, fully synthetic oils tend to provide more stability as they are less prone to break down in the presence of high heat (think high performance engine applications such as supercharged or turbocharged cars). Additionally, much higher multiple-viscosity ranges are achievable for synthetic oils which means your engine is better protected during cold start and at full operating temperature. In other words, they flow more easily at low temperatures and don’t get too watery in consistency at high temperatures. It’s also worth noting that oil consumption tends to be slightly reduced when running a full synthetic oil due to the added stability. In addition, small molecule size and consistency tend to provide better lubrication to protect your motor. Perhaps one of the biggest conveniences that you’ll notice is that synthetic oils tend to require less frequent changes than conventional oils. In fact, usually the base oil itself is still fine when it’s time to change the oil. Most often when using synthetic oil, the filter and oil additive package are what break down and tend to require replacement so these two items are what tend to set your oil change interval. The takeaway here is that you have to take your oil filter wrench and oil drain pan out of your tool cabinet less frequently for oil changes, which saves you time and cost over the long run! A final performance enhancement worth mentioning is that due to reduced friction relative to conventional oils, switching to synthetic oil can sometimes result in a very slight uptick in fuel economy and horsepower. When it comes to discussing the disadvantages of synthetic oil relative to conventional, there are a few that are noteworthy. First, the cost is typically higher per quart when buying synthetic oil. When comparing costs, it’s important to remember that if your oil change interval increases, you reduce the costs associated with having to change your oil so frequently so the true cost difference over time isn’t that high, but it still exists. Another common complaint regarding synthetic oil is that it tends to find leaks more readily. Early synthetics had differences in seal-swell rate (that have long been corrected) that exacerbated this issue, but the issue still persists to this day, albeit in lesser severity. The reason for this issue today is oil molecule size. Synthetic tends to be made up of small molecules that are uniform in size. Unlike synthetic oil, conventional oil is made up or both large and small molecules of different sizes. The small molecule size associated with synthetic oil means that the oil can often find its way into small leak points sooner than conventional oil which means you are more likely to see synthetic oil drop onto your garage floor. On the flip side though, synthetic oil also tends to lubricate better than conventional for this very reason. We thought we’d take a moment to mention the improved environmental impact of synthetic oil versus conventional. There are a couple of reasons for this. First, synthetic oil tends to create less oil vapor when heated than conventional oil. Second, and likely the more dominant reason by far is that you can extend your oil change interval significantly when using synthetic oil, meaning that you ultimately create less waste oil than you would when using conventional oil. While it goes without saying, if you do decide to change your own oil, we ask that you make th effort to dispose of it properly. Most oil change shops and auto parts stores take used oil as will most municipal waste management companies. Oil weight pertains to the viscosity of the oil or in other words, how willing the oil is to flow. As an example, water has a much lower viscosity than honey. The Society of Automotive Engineers (SAE) has established a numerical rating system for describing the viscosity of an oil. There are two predominant types of oil: straight weight and multi-weight. Straight weight, also called single-grade, simply refers to the fact that the oil has one viscosity rating at all temperatures. Some examples of straight weight oils are 10W and 20W. Straight weight oils are relatively uncommon in passenger cars these days. Instead, most cars nowadays run multi-weight oils, meaning that the oils behave differently when hot or cold. Some examples of common multi-grade oil weights are 5W-30, 10W-40, and 20W-50. The first number in the series pertains to the oil viscosity rating at low temperatures (ambient temperature when the car is not running) and the second number in the series pertains to the oil viscosity rating at 212 degrees Fahrenheit (full operating temperature for a running car). The reason multi-weight oils exist is to provide more flow when cold and equal protection when hot compared to a straight oil, which better protects your engine from wear. When it comes to selecting weight, we recommend that you stick with what your manufacturer recommends. This typically can be found written on your oil cap or in your owner’s manual. If you live in a particularly cold climate, you may be able to adjust the cold rating down if your owner’s manual permits. Similarly, if you place extremely high demands on your car (like autocross, track days, or off-roading), you may opt to run slightly thicker oil. It’s important to note that running oil not specifically recommended by your vehicle’s manufacturer could void your warranty. What Ingredients Are In Synthetic Oil? Group I: Conventional, non-synthetic oil. Made of fractionally distilled petroleum refined to improve certain performance categories like wax content and resistance to oxidation. Group II: Conventional, non-synthetic oil. Made of fractionally distilled petroleum that is further refined by hydrocracking (a hydrogen based treatment). Group III: Considered synthetic oil, but arguably has some significant similarities to conventional oil. Similar to Group II but with higher viscosity indices due to further hydrocracking refinement. Group IV: Synthetic oil. Comprised of polyalphaolefins (PAOs). Group V: This diverse group describes any base stocks that does not fit into any of the previous four groups. Perhaps the most preferred base stock is Group IV as it tends to have the best overall lubrication and protection properties of all the groups. While a typical base stock can make up 80-90% of the oil formulation by volume, additives in oil comprise the remaining portion of the formula. An additive package is typically added to tailor the base stock to meet a certain set of requirements. The additive package tends to modify how an oil breaks down chemically, the viscosity, the lubricity, interaction with engine seals and gaskets, and corrosion properties. An oil additive package also occasionally contains detergents to limit engine deposits that manifest in the form of sludge. Perhaps the most famous additive is ZDDP (zinc dithiophosphate), which is added as a wear resistance agent. While the API limits the concentration on some modern oils, it is often found in high concentrations in racing oils. Older engine designs tend to benefit from high ZDDP content as it offers necessary protection for common old-school camshaft and lifter configurations. 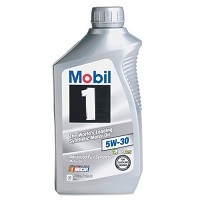 When it comes to the best synthetic oil for the money, our favorite is Mobil 1. This is the oil that we personally use in all of our daily driver vehicles at the time we write this article. Mobil 1 has a wide range of products ranging from synthetic motorcycle oil to oil for cars, boats, and planes. These oils come in a variety of weights ranging from 0W-40 to 15W-50. They come in a variety of flavors including Extended Performance for longer oil change intervals and High Mileage for aging cars in addition to their standard synthetic. These different product lines are distinguished by their excellent additive packages which tailor the properties to the intended use. Mobil 1 oils designed for automotive use are also API certified. When it comes to confidence, Mobil 1 has plenty of it, and rightfully so. In the 90’s, Mobil conducted a million mile test using an e30 BMW 325i. They drove the car on a dyno at various speeds to simulate every day driving. After 1 million simulated miles, the engine was broken down and inspected with only minimal wear. 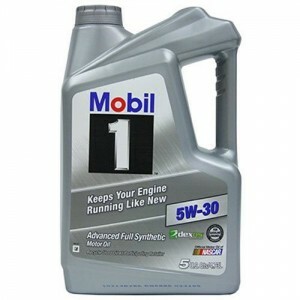 One more nice thing is that Mobil 1 synthetic oils are widely available so you can get them pretty much anywhere online. Overall, you can’t go wrong with Mobil 1 synthetic oils and we give them our highest recommendation. Click here to read more reviews and see prices. Castrol has long been a favorite synthetic oil for cars and heavy machinery alike. Their main fully synthetic oil product line is Castrol Edge, although the lower weight range in their GTX Magnatec line (0W-20 and 5W-20) is also fully synthetic. The higher weights in the GTX Magnatec line are blended (5W-30 and 10W-30). Castrol has a lengthy history of being specified for factory use in many high performance BMW, Audi, Honda, and Volkswagen models to name a few. 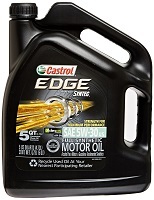 In any case, we typically recommend the Castrol Edge line as it features their Fluid Titanium additive package which is a marketing name for one of Castrol’s additives responsible for friction reduction and improved film strength. Castrol provides a pretty wide range of oil weights ranging from 0W-20 to 10W-60 so it is highly likely that they have the correct weight for your car available. Redline synthetic motor oils have been a favorite of many racers and high performance drivers for years. Redline makes some absolutely fantastic oil, however there is one major caveat that you should be aware of. At the time that we are writing this article, Redline Oils are not API certified by their own choice. Redline has claimed on their website that this is due to the overly stringent limitations on ZDDP that can be contained within API certified oils. As we mentioned previously when discussing additives, ZDDP is an additive that does particularly well in engines with old school camshaft designs and Redline adds ZDDP in excess of the API standard. In fact, we personally run Redline’s synthetic 20W-50 in one of our own BMW M3 autocross cars for this very reason. It’s important to note that many auto manufactures require that API certified oils be used or else your warranty could become void. As such, we do not recommend Redline for cars with active warranties. Once your warranty is expired, there is no longer anything to lose. If you have an old school race car and think you’d benefit from some extra ZDDP protection, we recommend Redline! Royal Purple makes both API certified and non-API certified synthetic oils. 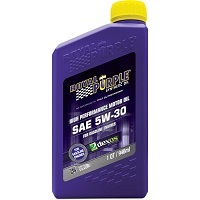 They make a standard synthetic that is simply called Royal Purple Synthetic Motor oil which comes in a variety of weights ranging from 0W-20 to 20W-50. They also sell it in straight weight SAE 30, SAE 40, and SAE 50. This oils are API certified. Royal Purple also makes non-API certified oils branded HPS (High Performance Street) and XPR (eXtreme Performance Racing) that contain higher percentages of certain additives such as ZDDP. These oils will void a factory warranty on a vehicle in many cases, so these should be considered only for cars that do not have an active warranty. They are ideal for track use and off-road use mainly as well as on cars with older camshaft designs. Pennzoil is another long standing oil company that makes fantastic synthetic oil. 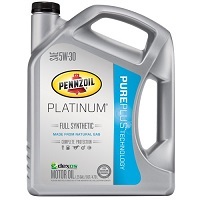 Pennzoil’s Platinum and Ultra Platinum lines are their fully synthetic products, which are the Pennzoil oils we recommend you choose. Interestingly, Pennzoil can be found as the OEM oil in many factory Ford cars, Chrysler cars, GM cars including some variants of the Corvette, and some Honda cars. They also can be found in high profile race series such as Indy or Le Mans. They have oil weight ranges from 0W-20 to 10W60 including the extremely common 5W-30. Of note is that Pennzoil’s base oils are refined from natural gas which they describe as PurePlus. As such they have high purity and potential for reduced or altered environmental impact. Pennzoil adds a decent additive package to their base oil for improved wear properties and friction reduction as well. Overall they make a great oil! We hope that this guide has been helpful in identifying the best synthetic oils on the market. While these are our favorites, there are many brands out there that we didn’t discuss in this article. While we think you will be in great shape if you choose one of our recommendations, if you find that they aren’t quite to your taste, feel free to have a look at other synthetic oil options available by clicking here. Thanks for reading and happy wrenching!